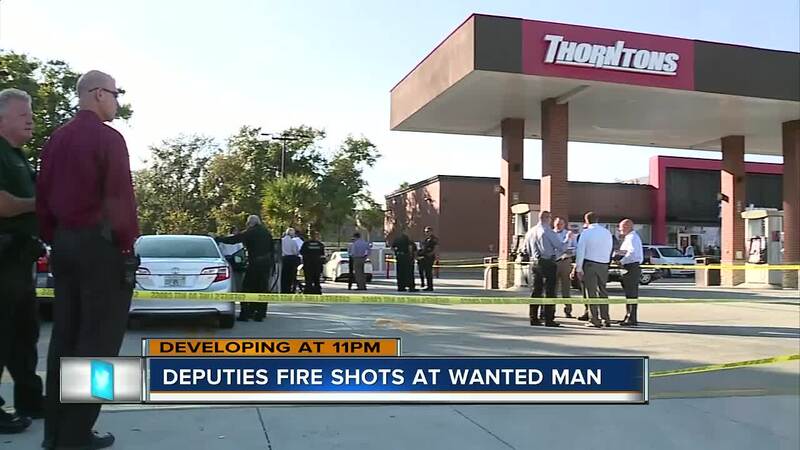 Pinellas County detectives are investigating a deputy-involved shooting at Thornton's gas station in Palm Harbor. PALM HARBOR, Fla. — People who live off Ranchette Lane and Belcher Road came outside to what looked more like a war zone than their cozy suburban street. "I saw an automobile speeding up the street and trying to evade the police officers, and I saw two cop cars behind it bump it and made him lose control of the automobile," Aaron Holmes said. "The suspect ran through the shrubberies of the neighbors, and after that, they tackled him on the road." Holmes didn't know that a little more than a mile away that same man was shot at multiple times by deputies with the Pinellas County Sheriff's Office. It was just before 2 p.m. Thursday that witnesses at the Thorntons on U.S. 19 and Tampa Road in Palm Harbor heard a barrage of bullets. "I couldn't see who was shooting; I just could hear it," Ed Brown said. Brown was texting his wife when the shooting happened. He described hearing 8 to 10 shots. "I just ducked afraid it was going to hit me," Brown said. Deputies didn't reveal a lot of information at either crime scene. A simple statement by a uniformed deputy helped ease the tension for people in the neighborhood. "We got the bad guy," an unidentified deputy said. A pair of white shoes marked the spot where the police tackled in the middle of the road. Witnesses said he tried to escape through the woods, but he was trapped. "Had his pants around his legs, underwear half off, bloody, beat-up looking," Matthew Raymond said. "No way out. What I’m wondering is why he would pick a dead end road to haul down you know?" Despite the pursuit down a very busy Belcher Road and multiple shots getting fired into the getaway vehicle, no one was hurt.